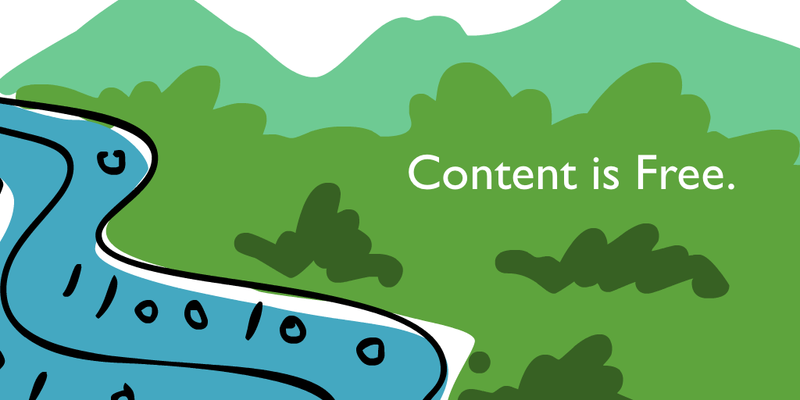 →How To Get Unlimited High Quality Niche Specific Contents For Free? How To Get Unlimited High Quality Niche Specific Contents For Free? If you are in the Internet marketing field and dealing with SEO, you know how important content is for the website itself and building backlinks. The content must need be unique, whether you publish it on your own blog, use to guest post, submit to article directories or publish it to web 2.0 sites. Many of us hire writers or spend hours to write ourselves. 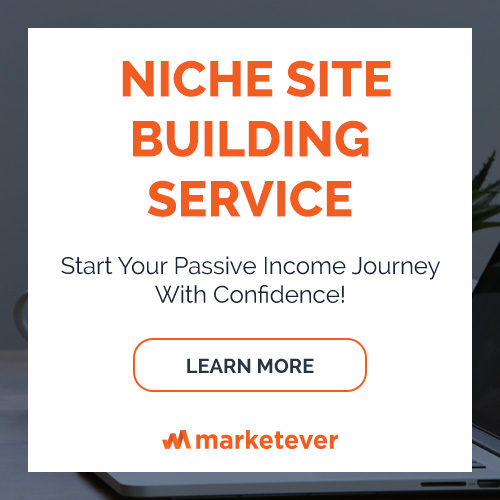 But all that is about to change for you, I’m going to show how to get high-quality niche specific or relevant content without costing a penny! 10 Million New domains are being registered every year, and a huge number of blogs are being created. Not all the blog owners are continuing them, so it gets expire after the registration period is over. These websites are deleted from the Internet, and the contents in these websites are de-indexed from Search engines like Google. One can easily search these deleted blogs to find the high-quality contents on their niche and use it to promote their own website; it is really easy and doable! Just follow the steps mentioned below. Steps 1: The first thing you need to do is to find your niche to work on. Suppose you are working with an automobile website so that is your niche. Steps 2: Find the expired domains you need to get the content for your niche. To do that, go to Godaddy Auctions [You can alternatively use Expireddomains.net]. Click “Advanced Search” tab. Type your keyword on “Keywords” option. Then click on Expired tab, and you will see a whole list of expired domains focused on “Automobile”. You will also notice that there is traffic estimation for the websites. 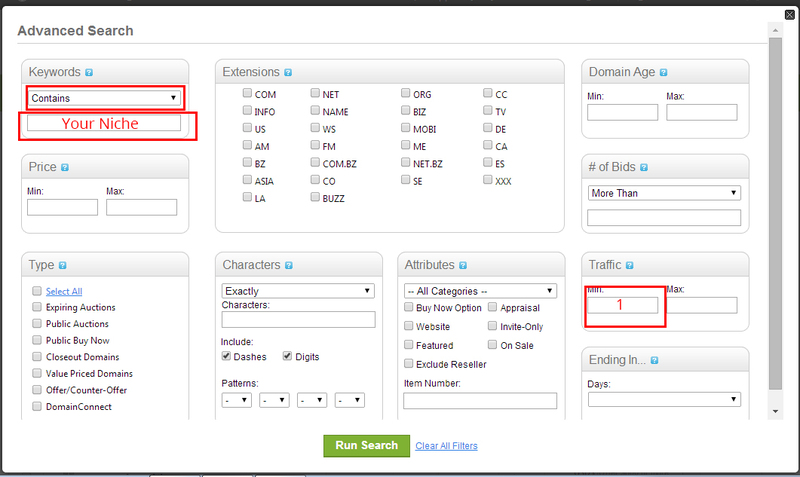 Select the minimum range as 1 to find the quality blogs. Click on the image to see fill view! Step 3 : Visit to archive.org. It saves every website that has ever been created and indexed. Now, put your expired website address and click Browse History. The option will take you to a panel where you will see how many times the website was indexed and during what time range (in years). 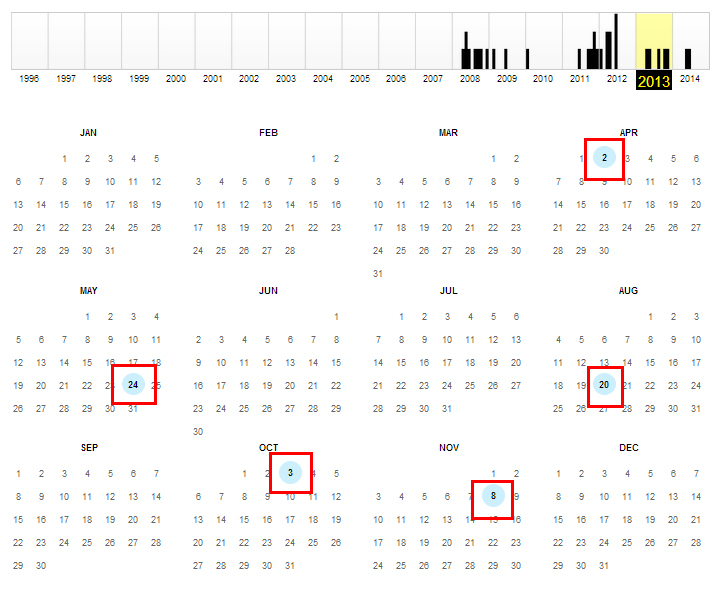 Select a time where the cloud (which represents indexing frequency) is mostly condensed. By selecting a date in the timeline, you will actually be able to visit the website. Load the website into a different tab. Now open the pages full of contents one by one. A word of caution: There are blogs that you will notice, which weren’t indexed many times during their lifespan. Don’t use them as you will not find any high-quality content there. Step 4 : The next thing to do is to check if the content was published elsewhere during its time and the fact that it is still indexed by Google or not. Copy the first few lines of the content you found and paste it within quotation marks (“”) in Google search panel. If the content was published somewhere, the link of the website will show up. If the lines of the content you took shows up in Google, copy the whole content, go to Small SEO Tools Plagiarism Checker and paste the content. After entering the captcha, it will show you how much of the content is unique and how much is not. If the whole content is not unique, it is of no value to you. If it shows the content is 100% unique, save it now! The article will surely help you in finding the unique content you need for your brand or website’s promotions and earn you precious backlinks. If you want similar posts, keep yourself updated and visit my blog. You can post your questions regarding this topic in the comment section. I will be happy to answer. Hi, I have read the post carefully and i amazed. because it’s robust technique. Hope lot of bloggers don’t know , how to get quality unique content and post regularly.This post is essential for them also me. I seem your guideline able to find professional and authority content.Thumbs up. Thanks for the heads up, Shahinuzzaman! Content is really crucial factor for ranking in these days and you are showing how to get contents for Free!! That’s really cool trick. But one thing that came to my mind is that since these contents were written by others, so it’s very possible that they may use these contents again for their any other websites. So using these contents in my own website can fall my site in risk too. But using these free contents in article directories and web 2.0 sites can be still great! I’m glad that you lived the content, Bivash! Hi, I go to go daddy and I do everything that you said but it returns “no results” for quite of few keywords in different niches that I searched for with advanced search. Can you help me, maybe I am doing something wrong. keep posting these really awesome tips with us and again thanks. I have a question about this: copying the exact content from an expired site wouldn’t inflict some copyrights from the author? Isn’t there a risk in doing this? Great blog btw; I’m finding it very helpful. By following this way, I started my blogsite. I was following your steps but one confusion arise, I found some quality content but what I search couple of lines of the content, one result shows up from Google + because the owner of that expired domain post his content on Google + So should I use that content now or google will raise duplicate content flag? Al-Amin Kabir bhai, First of all take my salam. I’m really getting help to prepare about an Affiliate Marketing as a new learner to become Online Marketer. I hope you will continue this helping path way for every new born person in this sector. Wish your all the best. Hi Amin, I saw your article (well not this one) from Niche hacks… I never heard of this technique, it’s 2016, is this technique still viable? I get my first unique content. I applied your technique, is very easy and very effective. I try this and have some good response. Almost content on my blog, I using this way to created content. Though this sounds harmless, the owner of the content might still be reading blogs in the niche and come across yours and see that it’s linking to your blog. Then they can threaten you or publicize that you stole their content. They may be writing another blog using these same articles. Maybe just contact the blog owner and ask permission, or offer a few bucks for an article, even fifty cents? They might just give it to you. I have a couple blogs I took down or let expire, but I may want to redo the blogs when I have time. I still have the articles on my computer. I would never have thought someone might copy them from the archives. The Archive is a good place, it’s not intended to be a free-for-all. Anything you do leaves a trail. I’m going to start doing searches for sentences in my old blogs. I do all my own writing and don’t outsource, no one should steal my content I worked hard on. Anyway sorry to freak out. I think it’s cool to know about how to find expired domains and to look at them, and get ideas from the articles, but I’ve been looking so far (not to use articles, but just out of curiosity) and all I see so far are hastily written articles with no value to the reader. I think it’s fine to get ideas from this content, even rewrite it, but copying it just seems not only unethical but potentially could get you in trouble, they can get back at you so easily for free and cause a lot of trouble, it’s not worth it for some junk articles or even good ones. Glad I found this post, thank you very much Al-Amin Kabir for posting this technique. Now i am gonna build a web 2.0 blog for my site. Thank a lot for providing valuable information. I was your anchor link where you have mentioned your preferred web 2.0 site list and I did not get site lists. could you please provide list if you have collected in your blog. sir,i can’t get the link of advanced link from godaddy as you mentioned.Can u help me how can i reach . Great post!! Learned something new today. I’ll definitely try this technique for my next niche blog. BTW Expireddomains.net is a very useful site. Thanks for sharing these tricks. great written article. and by this technique you can get content for your web 2.0 backlink blogs. cool idea. thanks kabir. Wow, this is a great idea and time saving solution for all bloggers. Thanks for the valuable information. Should I even use gmail for emails connected to the web 2.0’s or go with another email client like yahoo, etc.? What a great technique! Thank you for sharing this. Let’s hope the word hasn’t gotten out just yet. I will go try this right now. Do keep the amazing content coming along please. Thanks for sharing this actionable post. I used them for one my clients niche oriented sites. You’ll get the good amount of content and can use that for blogging for your brand. I enjoy following your post. Thanks for the tips !! I have a question : what about the legality of expired content ? Hey this a GREAT technique. I’ve never ever heard or read this technique anywhere else online. I will be definitely using this one. Thank you!! Can you tell me the alternate of wayback machine, because most of the domain did not show their data in way back machine. 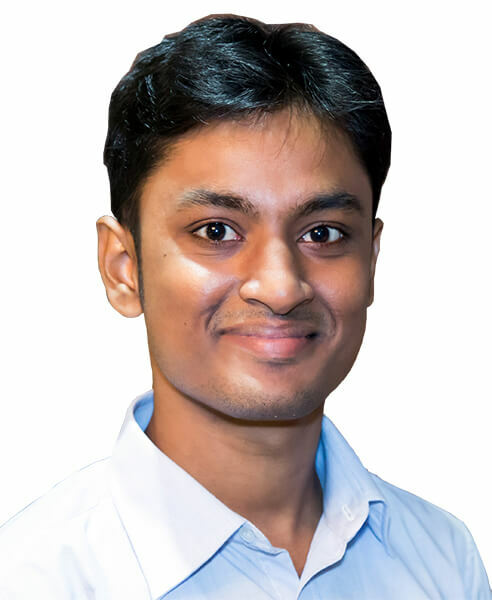 Hi there, my name is mubarak.i am completely beginner in affiliate marketing platform.I carefully read the blogs and i was surprised.Its really profitable and helpful for me.but i have a quetion that in the end of 2017, i didnt find the expectable result after search in google step by step of the expires websites.I put those content into the search bar like (“www.bla bla.com”).But i dont get the result as u say.so can u give me the solutions like tis type of problem. I think its upgraded myself into advance level in affiliate marketing .Morever, you know that how much important the content for an website.I think you get it that what i want to ask you. Thank you Al-Amin Kabir for this article. It will really help many of us. But I have a question. If I collect those contents will the backlinks that has created for that article remain available? And will it help my site to rank? I feel amazing about hearing about the expired article. Are really work the expired article? However I think that many people use that so hope that works. Anyway would you like to make any speeches for that? I have tried this tactic many times but didn’t get success. Finding a related expired domain is hard and even harder to get content for your niche. Thanks for the indepth post. What do you think about using good spun content on web 2.0 like tumblr?